Since I haven’t sprung for a custom bike with wiring guides or internal cable routing, I’ve had to improvise on my taillight wiring schemes. 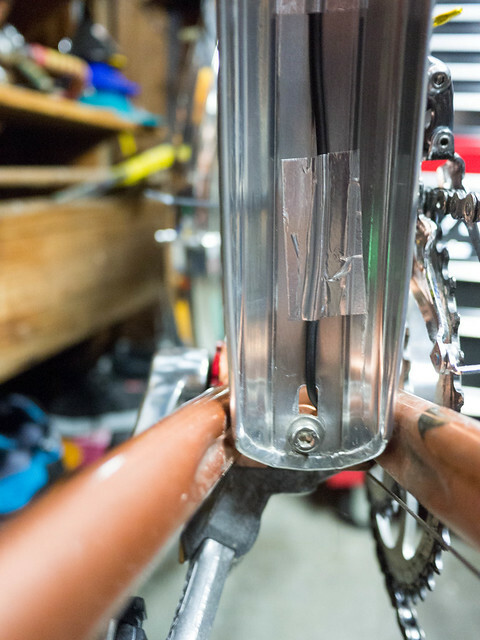 The first few times I just strung the wire along the down tube, chain stay, and up the fender stay to the light. I fastened it with zip-ties. This was fairly clean from the drive side view, but resulted in some zip-tie mess on the non-drive side. 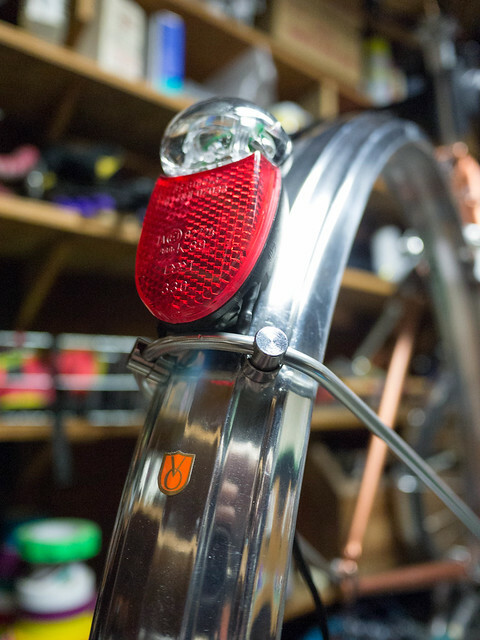 The last few times I’ve wired up rear lights, I’ve managed to put them under the fenders, eliminating the mess from the down tube. The key has been aluminum tape and careful fender drilling. Someday, I may get up the courage to drill into the fork or frame, but for now, I’ll play it safe. You can see the white bike in the background has a similar setup, but instead of routing the wire up the fork leg with zip-ties, I glued shrink tubing on the inside of the fork leg, and the inside of the front rack. This is used to guide the wire without the use of tape. 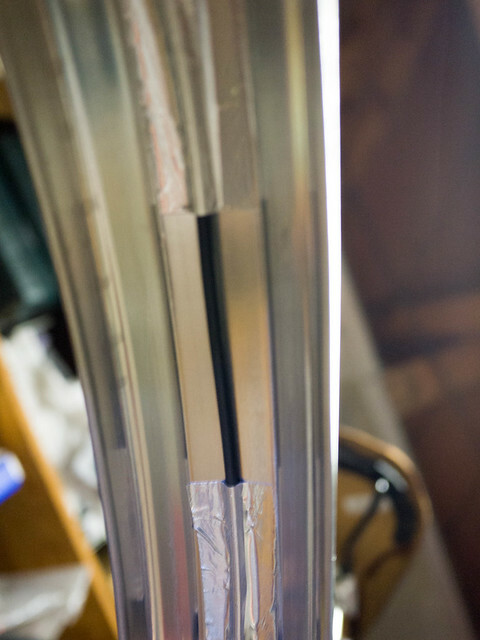 Note – on the white bike, the electrical tape I’m using to fasten the wire to the down tube is starting to peel off a bit after a few hundred very wet miles. It may be replaced soon. That is one area that the zip-ties win – I haven’t had one come loose yet. I’ve even taken to loosely tying the wire to the derailleur cable. Only an issue when you change cables, and the small zip-ties are pretty unobtrusive. 1. Do you have any tips, warnings, lessons learned, etc. for mounting the VO Zeppelins to a Hilsen? 2. Do these fenders not have adequate rolled edges through which to run the wires as Jan Heine suggests? 3. Do you expect adhesion failure in the aluminum tape under wet conditions? 1. The Zeppelins were the easier fenders I’ve mounted recently. I had to do a little pulling apart to get them reshaped correctly to the tires, but the stays were easy to cut, and the daruma was easy to install. Oh yeah, and the aluminum is soft and easy to drill. 2. The edges are rolled closed instead of being open enough to fit the wire in like on the Berthouds. I didn’t want to bother trying to unravel the edge. 3. I will be keeping a close eye on this and will report. The aluminum tape is stickier than normal electrical or gaffer tape. Now that I think about it, my other low trail frame hasn’t had any problems with a Cane Creek roller bearing headset and I’m not exactly around any long, steep descents. I probably shouldn’t worry about it. 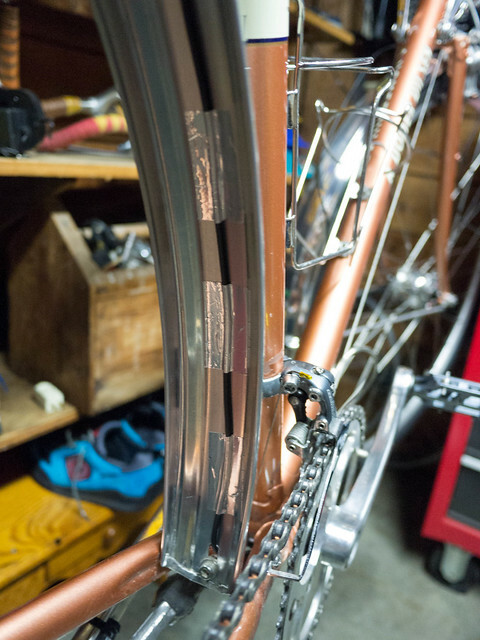 I like using cable clips for the wiring on the downtube, and I’ll secure it near the top with twine wrapped around a band of cloth tape. 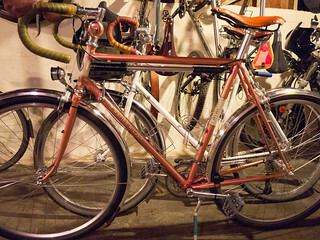 I have an unrelated question about your Velo Routier build. Did you use a needle bearing headset? I read in your review that you didn’t have any shimmy problems, and I’m trying to decide if I should take a chance on installing VO’s rinko headset which has cartridge bearings. The frame I bought had the standard headset installed. I believe it is a Neco needle bearing headset based on the build description on the web site.